Thyme is the October 2016 Plant of the Month for Boulder Colorado landscapes – Glacier View Landscape and Design, Inc.
Thyme (Thymus praecox) is a fabulous ground cover to use in a variety of landscape applications. There are 7 main types in use in Boulder Colorado landscapes and in much of the US, but there are hundreds of sub species. They are a versatile and adaptable species of ground cover with an abundance of flowers at certain times of the year. Thyme stays very low growing (1-2”) and can even be used in cooking, as an insect repellent, and as an essential oil. Generally a low moisture plant species, they are great to plant in moss rock dry stack walls, in between flagstone stepping stones, or even in an informal flagstone patio. The rhizomes will creep along underground and spread throughout the cracks between the stones, leaving a carpet-like appearance. Most are durable and can be stepped on without damaging the plant. They come in a variety of colors with white, red, and lavender as the most common. Once established with roots under rocks, they can survive on little to no additional moisture than the 16-18” or so per year here in Colorado. People have been cooking with Thyme for hundreds of years. Use Thyme to marinate steak or hamburger, sprinkle on salads or use in salad dressing, and even as a potpourri. Add it to spaghetti sauce for that true Italian flavoring! It can be used fresh from the garden, or dried and stored as any leafy herb would be. Keep it in your kitchen cabinet all year long. There are even uses for the essential oils from Thyme including aromatherapy and as an insect repellent. Thyme is best planted from flats of 32 in 2 ¼” pots, since they are easy to squeeze between rock cracks. 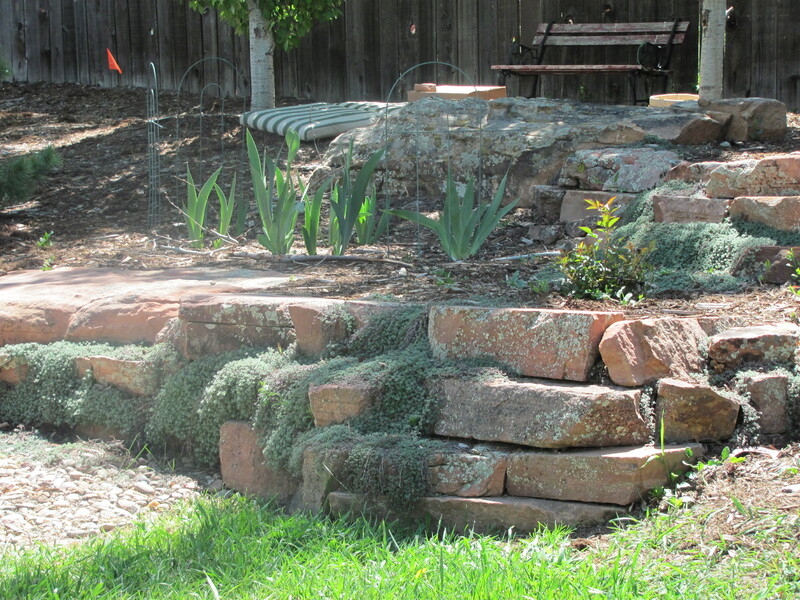 Some soil amendments here in Colorado are helpful, but the plant will do OK in a rocky, nutrient poor soil also. Light but consistent watering when first planted until established is necessary, but be careful of overwatering and root rot. Cutting out winter kill in the spring will help the plant thrive the following winter. Plant a flat or two in your landscape and see where it takes you! Check us out on Pinterest for more of our photos.